GE adds to their comprehensive portfolio the latest dead tank circuit breaker with SF6 interrupting technology for electrical grids up to 245 kV and 63 kA without TRV capacitors for short line faults. This robust model ‘DT1-245P 63' is built with advanced switchgear technology based on GE's field-proven spring-spring-operated mechanism, and interrupters with double-motion technology for exceptional reliability. 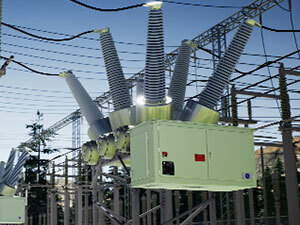 Reliability is critical because high voltage circuit breakers are truly at the heart of every substation, protecting the electrical equipment and infrastructure through operational and safety functions. GE's DT1-245P 63 model is rigorously tested to ensure DT1-245P 63 long-term operation, even under harshest environmental conditions. Specifically, the DT1-245P 63 has undergone extensive mechanical testing to 10,000 close/open operations with M2 certification, high seismic condition testing, as well extensive testing at extreme temperatures. Furthermore, the breaker meets or exceeds the latest IEEE/ANSI standards, including defined purpose applications, such as reactor and capacitive switching. Each breaker is also factory tested using GE's proprietary gas tightness testing system. This internal process provides measurable, quantifiable test results on the breaker in its fully assembled, as-shipped condition, including a tightness guarantee of less than 0.5 percent per year leakage rate, providing an overall low lifecycle cost with maximum availability and reliability. The center of excellence for dead tank circuit breakers, including manufacturing and testing facilities, is located in Charleroi, PA (USA). Here, a high degree of domestic content is used, which can help to facilitate compliance to national requirements. GE validates its leading position in the design and manufacturing of dead tank circuit breakers with deep domain expertise, the latest product innovations, and with 25,000+ installations globally.